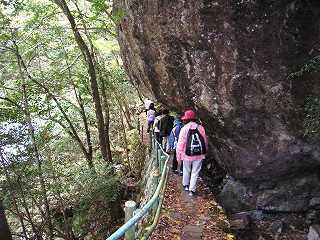 "Tyoumonkyou" (Choumonkyou) is a valley that is Yamaguchi prefectural Wildlife Park. It is a zonal park including the "Abu river dam" and the "Sasanamikawa dam". It is scenic sites that became places of scenic beauty of the country specification in 1923. 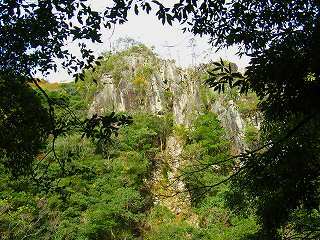 The valley where the massive rock, rocks of fantastic shape, the rapid stream, the waterfall, and the abyss are beautiful in union with a peripheral plant group is formed. "Tyoumonkyou" is specified for "Place of scenic beauty and natural monument " of the country and Yamaguchi Prefecture. This photograph is the near one a little having done toward from the palace of the sea goddess pool to Choumonkyou-station. It walked from the lower part of a river on the west side of the river toward upstream. The massive rock and rocks of fantastic shape lie about. It was a valley that because it was after rain about two days ago a lot of volume of waters, and was impressive. 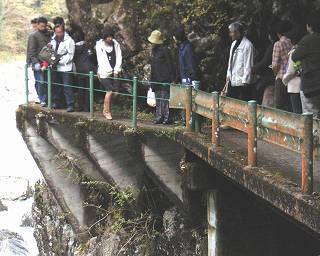 In the gorge postponed from Yamaguchi Choumonkyou-station of Yamaguchi Prefecture to the north-northwest, the entrance in the Abu-gun Ato-cho is roadside station "Tyoumonkyou". in the vicinity of JR Yamaguchi Choumonkyou-station. The entrance of the Hagi city is a palace of the sea goddess pool in the Abu river dam upstream. The narrow road will pass so that it may go to the palace of the sea goddess pool by car by being in the vicinity of Choumonkyou-station and the vicinity of the palace of the sea goddess pool (free of charge). The person that confidence is not in driving will avoid it. I will surely go to the rest room because the rest room is only in the parking lot. 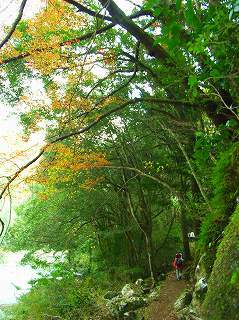 The shuttle bus between from palace of the sea goddess pools to Choumonkyou-station has been operated during the season of the autumn tint. Because the motor coach did not go, we also took the shuttle bus. Map in the vicinity of "Tyoumonkyou"
"The Hokkaidoumon-gate" and "Takashima cave gate"
"Tyoumonkyou" is an erosional valley of the granite porphyry. 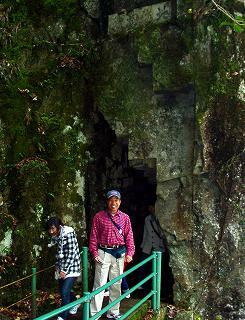 This cave gate is a tunnel where a big rock "The Hokkaidoumon-gate" of the place where it went from the palace of the sea goddess pool to the upstream by about 550m was hollowed. Digging up this cave gate might seem to have been serious, and the predecessors' hardships were recalled. 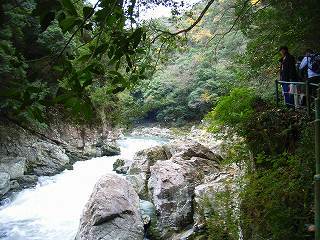 The cave gate had another one "Takashima cave gate" from here to the upstream also in the place of 1,150m. The south denomination painter who greatly contributed to a basic making of the "Tyoumonkyou" sightseeing road originates in geologist's "Takashima the North Sea" the name of these cave gates. This photograph is me. This is Suspension Bridge ""Momijibashi-bridge"" from the palace of the sea goddess pool to about 600m upstream. A red bridge where the rapid stream is stepped over matches to the autumn tint of surroundings and is particularly beautiful. I thought that the best viewpoint in "Tyoumonkyou" around here. A big rock that is vertically sheer of this opposite bank (right bank) is impressive with the autumn tint. There seemed to be tens of-100 meters though which extent height was was not understood. It was scenery that came out in the sumi-e painting of China. It was said, "Here is better than Oirase vallay" where it strolled by some accounts. It is certain that scenery is splendid though I have not been to "Oirase vallay". It was too a few or there seemed to be a lot of yellow leaves at the season of the chicken foot though this photograph was an autumn tint on the way. Strolling on such a stroll road is very pleasant. The highest temperature on this day was at the middle of November going this time, about ten degrees, and the first chilly feeling. The body got warm if walking, and just good feeling. It seemed in where it was hot if coming in summer, and whether this gorge was very cool. There was a standing signboard of "Handrail and danger" on the way, and the meaning "Do not have the handrail because the handrail was broken" when it was thought the meaning "Have the handrail because it was dangerous". The handrail rusted and it was broken. It wrote in the guide in the middle of the autumn tint season (the end of the beginning of November). 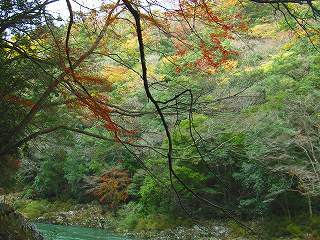 However, the season was passed for a moment or the color looked dark and dull a little occasionally though the autumn tint was seen. However, the mind was healed by scenery picturesque when seeing. In the synergy effect with a moderate movement, it was a comfortable day. There was almost a restaurant of "Suzugatyaya" in the vicinity of the center of the stroll road and it crowded with a lot of people. It was made to smell good. A lot of people bought it in a row. There was a place of which a big like this rock had gone out from on the head to the outside in the stroll road. It was not possible to pass if not bowing bending the body. Naturally, the person cannot pass each other here. Even the person who wants to walk fast cannot pull it out here. Moreover, there was a place that became feeling to which the massive rock that seemed that be the diameter number meter it seemed to drop, too and the earthquake seemed to be dangerous when coming. 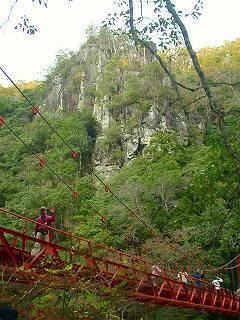 The stroll road is made from concrete in the vertical cliff like this. The bridge is built forward. It is a scary place when often seeing. It is a narrow road by cannot pass each other by the person who strolls on the stroll road. The poetic tablet of the poet and Mr.Nakahara-Tyuuya stood in "Senshinbashi-bridge" near "Tyoumonkyou-station". He seems also to have spoken very highly of this place. The price was a little like improving though a lot of surroundings of "Tyoumonkyou" were grounded cultivation about the pear and the apple, and sold to the roadside station.